Prince Edward, Earl of Wessex and the youngest son of Prince Philip, Duke of Edinburgh, and Queen Elizabeth II, presents awards at a ceremony in Tennessee. Earning the Eagle Scout Award or Venturing Summit Award opens doors. The awards are a proven launchpad in the United States, sending a young man or young woman on a rewarding career path. The Duke of Edinburgh’s International Award brings similar résumé-building clout to young people — only on a global scale. A new national partnership between the Boy Scouts of America and the Duke of Edinburgh’s International Award USA brings the opportunity to the United States. To date millions of young people (ages 14 to 24) from more than 130 countries have participated in the award program. With the U.S. now involved, the goal is to send that number even higher. 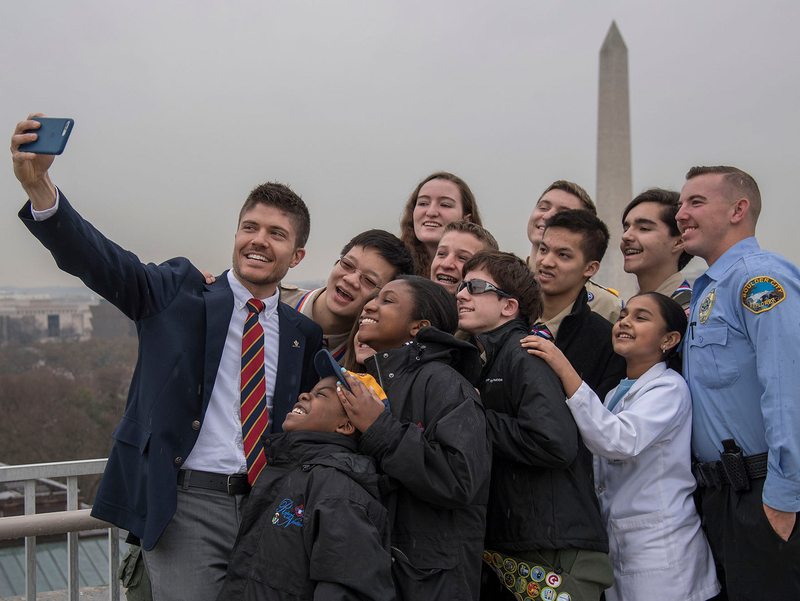 The BSA and The Duke of Edinburgh’s International Award USA team want to reach 500,000 young Americans — 1 percent of the population of young people in the U.S. — by the year 2026. “The Duke of Edinburgh’s International Award is a natural fit with Scouting’s programs, and we are proud to offer additional opportunities that develop and recognize the achievements of youth as the future leaders of the world,” says Michael Surbaugh, the BSA’s Chief Scout Executive. How difficult to earn is the Duke of Edinburgh’s International Award USA? The award is challenging but flexible. Its requirements sufficiently stringent but attainable. The award aligns with existing Scouting activities and advancement requirements. By simply participating in Scouting, a young person will fulfill many requirements for the Duke of Edinburgh’s International Award USA. The award is open to young people ages 14 to 24. There are three levels: Bronze, Silver and Gold. There’s a fifth activity, for those seeking the Gold-level award only, that involves a Residential Project. Examples of that include taking part in a historical re-enactment, building a new hiking trail, attending a conference as a youth representative and more. In addition to the chance to engage with the world and better understand themselves, you mean? Youth who earn their award at the Bronze, Silver and Gold levels are awarded an international certificate of recognition and a medal for their achievements at local celebrations. Gold-level participants also are celebrated at a national Gold ceremony hosted by the Duke of Edinburgh’s International Award USA. Why should a Scout strive to earn their award? It’s recognized worldwide with a globally-consistent framework, meaning award-holders have international standing. It enhances a young person’s résumé in an increasingly competitive marketplace. A Venturer who earned the Bronze-level award says the process taught him skills like planning in a welcoming, safe environment. How can an adult support this process? Add the award program at the BSA local council level. Local councils license to deliver the award to their Scouts and Venturers through Boy Scouts, Venturing, STEM Scouts and/or Explorers. Provide Adventurous Journey opportunities. Work with your local council camps or the national high-adventure bases to help facilitate the Adventurous Journey requirement to Scouts and Venturers. Recruit new award participants. Young people who are interested participating in the award program but are not connected to another local award unit can be referred to a local BSA council to join the award program there. Learn more this summer at Philmont. On July 15 to 21, 2018, the Philmont Training Center will host a course on the The Duke of Edinburgh’s International Award. Scouters will leave the weeklong course trained as Certified Award Coordinators and Certified Adventurous Journey Supervisors and Assessors. If your council, district or Scout unit is interested in delivering the award program, complete the form at the bottom of this page. If you’re interested in becoming a Registered Activity Provider only, register here. If you’re an individual Scout or Venturer interested in doing your award, register here.